Road rash is the common term used for a skin abrasion—an area on the body where the skin has been scraped off, typically from participation in an activity like skateboarding. The affected area usually looks raw and may bleed a little. Road rash is usually very painful, but it typically heals in a couple of weeks with at-home treatment. In some cases, medical attention is necessary because the depth of the road rash causes damage to nerve cells. If you or a loved experience road rash, they may not have feeling—even pain—in the deepest parts of the injured area. However, the skin around the edges of the road rash will be extremely painful. The affected area will appear red, raw, and inflamed. Bleeding is also common. Pain and swelling are immediately felt and may last for several days. In rare cases, road rash may cause blood poisoning, a severe infection that spreads through the bloodstream and may lead to septic shock. This serious condition causes blood pressure to become dangerously low, eventually causing organs to shut down. Road rash is usually the result of a fall or being dragged against pavement or dirt, as would happen in a biking accident or when playing a sport, such as baseball. The contact with the ground causes the top skin layers to peel way. Road rash injuries are more common in the spring and summer due to the weather being warmer and more people choosing outdoor activities. Moreover, because people tend to wear less and thinner clothing at these times, there is less skin protection when there is a fall or accident. Because road rash is usually a superficial injury to your skin, it usually does not require any professional treatment. It should heal within two weeks if you take good care of the wound and keep it clean and dry. Serious cases of road rash may go through the layers of skin and in those instances, it is a good idea to seek out medical attention. If your road rash injury takes longer than two weeks to heal, there is a chance the wound is deeper and needs evaluation by a healthcare professional. If medical attention is sought, a road rash diagnosis is usually made with a physical exam of the affected area. X-rays and other imaging may be used if the doctor feels the injury may deeper or there may be a bone break or foreign objects involved. If septic shock is suspected, your doctor will order blood counts, cultures, and oxygen level monitoring. Severe road rash should be treated by a doctor. Most of the time, however, road rash can be treated on the playing field, the road, or other area where the injury occurred. As long as there isn't excessive bleeding, you can also treat the wound once you arrive at home, if needed. A first aid kit likely contains all the tools you need to treat road rash. Make sure you go through steps 1, 2, and 3 below before making a decision to treat the road rash injury on your own. 1. Stay safe: If a person is injured and falls unconscious, do not move him or her unless the location is unsafe. 2. Treat life-threatening injuries first: Road rash is usually not life-threatening, though it can look quite disturbing. Don't let the presence of raw, bleeding wounds distract you from making sure an injured person is breathing and all dangerous bleeding (bright red and spurting) is stopped first. 3. 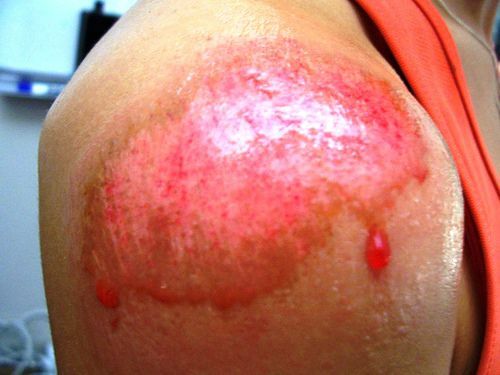 Stop bleeding: Usually, road rash oozes rather than gushes blood. A little pressure with a bandage or any clean cloth should adequately control the situation. If the injured person is unconscious, has problems breathing, or is significantly bleeding, call 911 immediately and follow the advice of the dispatcher before proceeding. He or she will instruct you on the best next steps to take while you wait for emergency medical services to arrive. If the injury does not seem serious enough to call 911, continue on with these next steps. Note: These may or may not be the same as those provided by a dispatcher in an emergency setting. 4. Rinse the affected area: Rinse the road rash with soapy water—maybe under a little pressure to help get all the dirt and debris out of the wound. It may help to soak the wound in soapy water before trying to remove the debris, and you may have to gently brush stubborn debris out of the road rash. In rare cases, it may be necessary to remove debris with sterile tweezers (if possible, that should be done by a medical professional). 5. Cover the wound: Put gauze on the wound and wrap it to hold it in place. Dry dressings work fine. If you'd like, you can moisten the first layer of dressing with saline solution or sterile water, but don't put antibiotic ointment on road rash. If you use a layer of moistened dressings, cover that with dry gauze before you wrap it up. If the injured person has not recently had a tetanus shot, talk to a doctor about getting one to safeguard against the development of tetanus, a serious bacterial infection that affects the nervous system and can be life-threatening. Pain will lessen as the wound heals. The affected area may feel tender while it is healing. If the abrasion is at or near a joint (e.g., the knee), that joint may feel stiff and sore with movement. A doctor may prescribe pain medication to ease discomfort. Anytime skin comes off completely and reveals underlying tissue, you should seek medical attention. Severe road rash should be treated like a burn and may require skin grafting surgery. The same applies for any road rash that is not fully healed within two weeks. It is possible it is a deeper wound and should be checked out by a doctor. Skin grafting surgery requires taking healthy skin from another part of the body. The donor site is usually an area that be hidden by clothing, such as buttock or at the inside of the thigh. The skin graft on then set on the area where it is being transplanted. It is kept in place with gentle pressure and padded dressing, staples or stitches. When Do You Need a Tetanus Booster Shot? Road rash usually heals well and clears with minimal scaring. It is a good idea to keep an eye on the abrasion. You can use an antibacterial ointment or vitamin E oil the following day to help promote healing. You should take off the old dressing and replace with a new one at least once per day and watch for signs of infection. Treatment for an infection usually requires an oral antibiotic. Untreated infections can lead to serious health complications that can be life-threatening.